TMT’s software and system engineers with the Sev1Tech team during the CIS Conceptual Design Review, on September 13, 2017, at the TMT Project Office in Pasadena, CA. Last month, the TMT Communications and Information System (CIS) passed a key test, making it ready to enter its preliminary design phase. A Conceptual Design Review (CoDR) was held at the Project Office in Pasadena to evaluate the proposed conceptual design solution and the technical trade-offs considered for TMT’s network and security needs. The details of the CIS design concept were reviewed and discussed during the full-day meeting, which was led by TMT Systems Engineering. The formal review panel included TMT stakeholders and subject matter experts from ESO and Gemini. The CIS CoDR was successfully completed. The TMT CIS system encompasses the TMT Observatory network infrastructure, IT systems and internet connection. In short, it implements the communications backbone between all TMT systems: telescope enclosure and telescope structure, science instruments, the adaptive optics system, various facility infrastructures, and the technical and science operations headquarters. 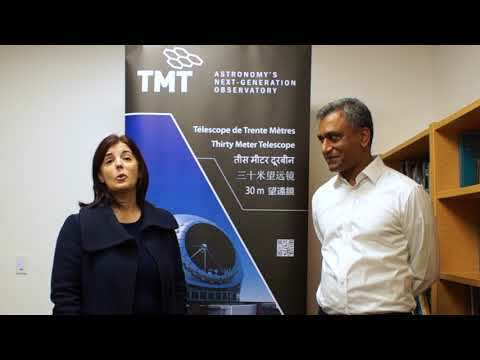 The TMT CIS also integrates an industry standard cyber-security model into the TMT infrastructure, enabling secured production, storage, and distribution of scientific data by the TMT Observatory. The CIS conceptual design phase was executed by Sev1Tech Inc., which was contracted to develop the CIS conceptual design and security strategy in collaboration with the TMT Design Operations and System Engineering teams. understand and clarify existing CIS requirements, including data volumes, rates, and performance required by the TMT subsystems. understand and capture the CIS interfaces. evaluate hardware and software technology strategies and options for CIS based on the CIS requirements. develop network architecture and security strategy. develop the operations model concept and high-level operations budget estimate. develop initial reliability and availability assessment of proposed architecture. develop a preliminary construction budget estimate and schedule outline for preliminary design, final design, procurement, assembly, integration and verification phases. The key deliverables included the CIS architecture for the data and controls network at the summit, which must meet strict performance and environmental requirements, and the security and operations strategies, which must be consistent with industry standards and best practices. Detailed technology trade studies that informed the CIS design solutions were also presented during the review. With the CIS conceptual design now completed, the next phase will focus on activities related to the development of the CIS preliminary design. Emphasis will be placed on supporting the final design phases of the following dependent subsystems: Telescope Utility Systems, Telescope Structure and the Adaptive Optics support facility NFIRAOS. All other TMT subsystems will continue their design activities based on the network architecture, interface definitions and data-rate performance baseline established by the CIS CoDR.